If you think the 2007 unveiling of the iPhone is tech’s most impressive demo, you haven’t seen anything yet! Back in 1968, when Tim Cook was barely 8 years old, an engineer named Doug Engelbart put on a computer demonstration at the Fall Joint Computer Conference in San Francisco. Over the course of 90 minutes, Engelbart showed off for the first time a stream of new technologies that would shape computing for the next half-century: windows, hypertext, computer graphics, the mouse, video-conferencing, word processing, real-time collaborative editing and more. Now those of us who missed it the first time around can see it live, thanks to a new avant garde opera taking place at Stanford’s Bing Concert Hall. Engelbart is probably the most significant Apple-related tech pioneer that most people remain unfamiliar with. Not only did his technology eventually find its way into the Mac, but his human-first view of computing would also become key to Apple’s philosophy. Several prominent Apple employees, responsible for everything from Siri to the iPhone, have personally told me what an influence Engelbart was when it came to shaping their view of computing. There’s another connection to Apple, too. Remember Whole Earth Catalog, the magazine Steve Jobs famously described as “Google in paperback form” and “one of the bibles of my generation” during his 2005 commencement address at Stanford? The camera operator at Engelbart’s famous demo was a young man named Stewart Brand, who later went on to be the founding editor of the Whole Earth Catalog. Brand also advised Engelbart and his team on how to present the demo. You can find more details about the opera version of The Demo here. 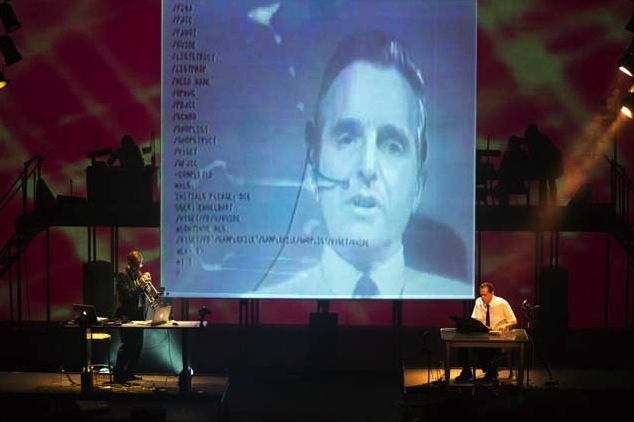 This isn’t the first time tech history has found its way onto the stage. Last year, France’s Opéra de Lyon staged a multimedia opera combining the story of Steve Jobs with that of Henry V, taken from Shakespeare’s 1599 play.